(from left to right) LCdr Tiffany Ticky, Cdr Matt Plaschka, Col Clifford Roseline, SPDF Chief of Defence Forces, Cmdre Darren Garnier, Lieutenant-Colonel Michael Poupponeau, Commander of the Seychelles Air Force, Lt(N) Joseph Horobetz, Lt(N) Linda Coleman. Commodore Darren Garnier, Royal Canadian Navy, Commander Combined Task Force (CTF) 150, visited the Seychelles from 27th to 31st March, 2019. This was his last regional engagement as Commander of CTF 150. The visit to the Seychelles was two-fold. Firstly, to conduct Key Leadership Engagements with members of the Seychelles People’s Defence Force (SPDF) and the second to welcome the additional assets from the Canadian Armed Forces to the CTF 150 area of operations. The continued contribution of assets to CMF is extremely valuable in maintaining maritime security throughout the region, where illicit activities including the smuggling of illegal narcotics, is taking place. During his visit the Commodore met Colonel Clifford Roseline, SPDF Chief of Defence Forces, Colonel Simon Dine, Commander of the Seychelles Coast Guard, Lieutenant-Colonel Michael Poupponeau, Commander of the Seychelles Air Force, and Lieutenant-Colonel Leslie Benoiton, Director of the National Information Sharing Coordination Center (NISCC). Seychelles is an important Combined Maritime Forces (CMF) member. With a keen regional focus on all areas of the CMF mission including counter-terrorism and counter-piracy, they revealed that for the Seychelles the narcotics nexus to the funding of terrorist activity is a top priority for their Defence Forces. As an island nation, the Seychelles fully understands the critical role that missions, such as maritime surveillance, can play to their own, as well as the CMF’s broader maritime security mandate. 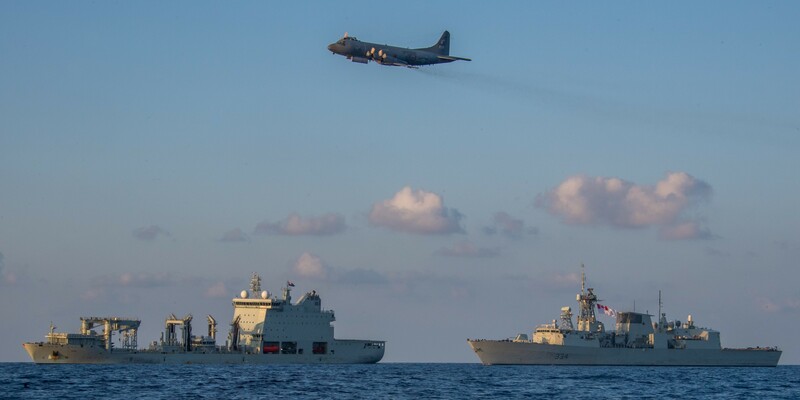 The Commodore also visited Her Majesty’s Canadian Ship (HMCS) Regina, accompanied by Naval Replenishment Unit (NRU) Asterix, and a Royal Canadian Air Force CP-140 Aurora as they arrived in the Seychelles on March 29. HMCS Regina, along with its embarked CH-148 Cyclone helicopter, and NRU Asterix will work in concert with several other coalition ships to patrol the waters of the northern Arabian Sea and the east coast of Africa, and the CP-140 Aurora will be employed to conduct concurrent maritime surveillance missions. All of these efforts are in support of CTF 150’s mandate to counter terrorism ensuring maritime security by enabling the free-flow of international trade and commerce in some of the world’s busiest and most challenging waterways. Commodore Garnier and his Task Force change CTF 150 command to the Pakistan Navy on April 11, 2019. HMCS Regina will remain under CTF 150 command until early June, 2019.